Here is a best thanksgiving turkey recipe. You can follow this recipe and have tasty feast on this Thanksgiving Day. Mix hot water and salt in a 54-quart cooler and keep it stirring until all salt is dissolved. Now stir in the vegetable broth and honey also. After this add ice and keep on stirring. Once you are done, place the turkey in the brine keeping the breast side up and cover with cooler cover overnight. After 12 hours, remove the turkey from brine and dry it thoroughly. Rub vegetable oil on bird thoroughly. Prepare grill by heating it up to 400 degrees F.
Use double thickness of heavy-duty aluminum foil to build a smoke bomb. Take a cup of hickory wood chips and place it in the center of the foil and gather up the edges by making a pouch. Leave the pouch open at its top. Set it on the metal bar over the gas flame and set the turkey over indirect heat. Set a probe thermometer in breast meat where it is thickest and set alarm for 160 degrees F. Now close the lid and cook for 1 hour. After this, check the turkey and make sure its skin is golden brown now. Cover it with aluminum foil and re-cook. After one hour, replace wood chips with another cup. 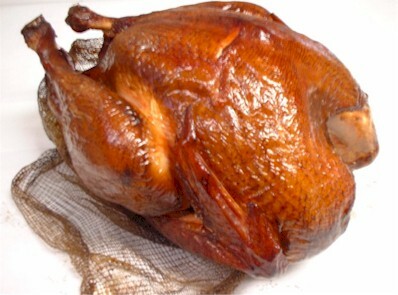 Once the bird is cooked up to 160 degrees F, remove from grill and cover it with aluminum foil and leave it for one hour. It’s time to carve and serve.